Passion! Hope! Joy! These are some of the words scribbled on sticky notes at the last MindCAP team meeting. Every Thursday morning, we meet to review progress of clients and encourage one another with new ideas. Anne says it’s her favorite time as a team member. 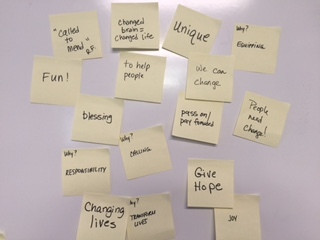 This week we brainstormed Simon Sinek’s Golden Circle question, “Why do we do what we do?” Other responses were transformational, unique, inspires, ministry, helps others, and changing lives. All of our team members sense a calling to do what we do. When you discover the Feuerstein program and then power boost it with growth mind set research and learning about neuroplasticity – you suddenly realize just how much the brain can change! How much I can change! And of course, all for the better! !